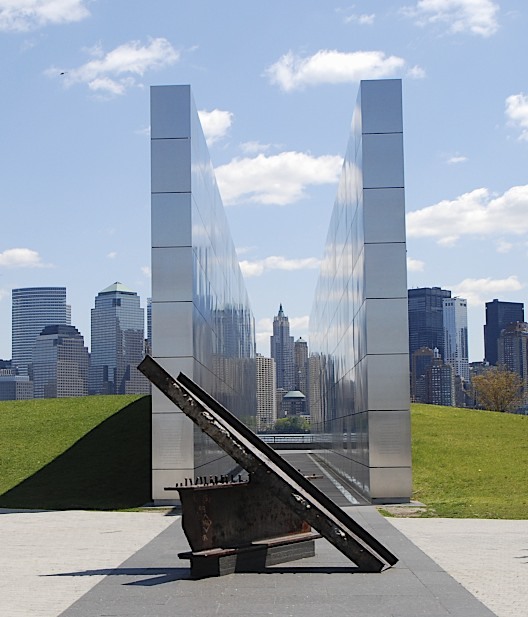 Yesterday, (5/14/13) we visited the New Jersey 9/11 memorial in Liberty State Park for the first time. It is a stunning, architectural and symbolic masterpiece designed by Jessica Jamroz and Frederic Schwartz, indelibly memorializing the victims and events that shattered the senses 11 ½ years ago. 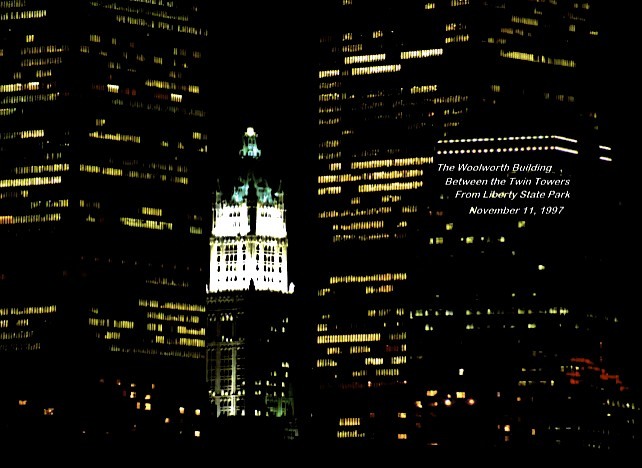 When viewed from the west end, the two stainless steel jacketed 30’ high walls, 208’ 10” long, emblazed with the names of New Jersey’s innocents, leads the eye to the exact location of the original towers – today empty, except for the “Empty Sky” and …the Woolworth Building, tallest skyscraper in the world until 1930. 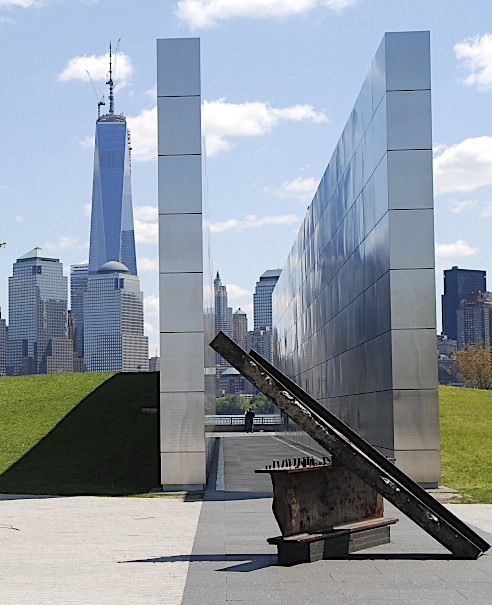 The walls, their length each the exact width of the original towers, block the new 1776’ (541m) ONE WORLD TRADE CENTER from view, offset from the original tower footprints for their respectful preservation. 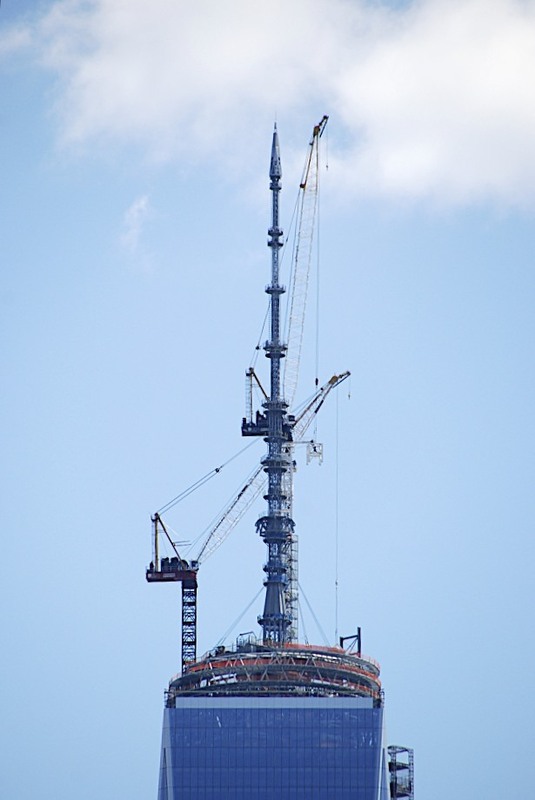 That awesome icon of the future, had it’s top spire placed just last week, seen here still with cranes working the job. What intrigued me, was the coincidental nature of the old (Woolworth,) and new (Twin Towers,) lying in the same line of sight. How remarkable! Thinking on this, I recalled pictures I took from this very same spot, 16 years ago, (Nov. 11, 1997) seen below verifying and completing this interesting perspective. Great pictures and description of the memorial. I hope to get there this year. 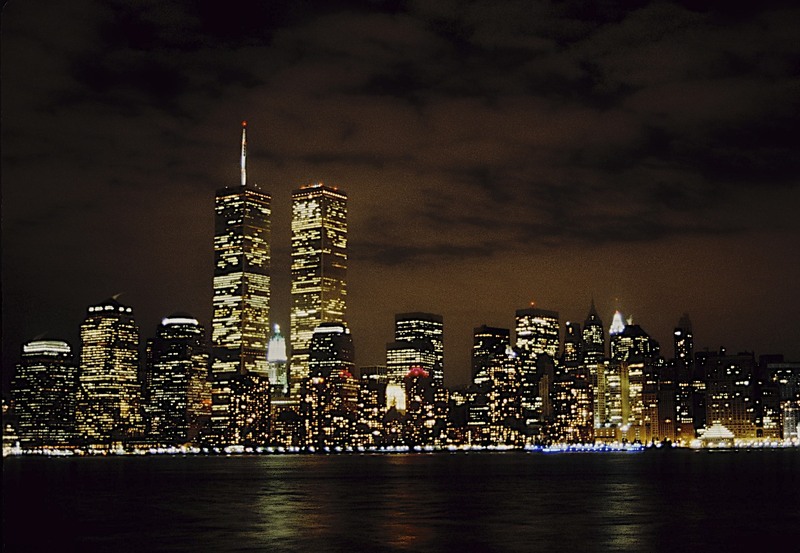 Wow, I’m sure glad # 1 WTC reappeared in photo #2! We visited the WTC area in 2007, six years after 9/11 and all we saw was a big hole. There was lots of construction going on but it was all below ground level. You’re taking me back! (You’ll understand from my other comment.) You know, I have never heard anyone mention “Woolworth.” I was jUst thinking of it (the store, not the building) I would frequent every Cmas growing up…thought of putting that in a poem. (Probably not ha ha) Funny I should see this post. I also once swing danced in the Windows of the World, atop the WTC. Sigh. Just crazy, what has happened. Beautiful pictures of the memorial…would love to frame your skyline at night pictures.